Du kan välja upp till totalt 14 resenärer. Upplev den världsberömda Grand Canyon och Hoover Dam i stil under denna 9-timmars lyxiga dagstur från Las Vegas. Resa ombord på ett fordon med lädersäten, USB-portar och uttag när du gör stopp vid Hoover Dam, Dolan Springs och Grand Canyon West Rim (plats för Skywalk). Rundtur på hotelltransport och lunch ingår, och tillvalet Skywalk biljettuppgraderingspaket är tillgängligt. The Hoover Dam was ok. I think my husband enjoyed it more than I did, the the Grand Canyon was very, very beautiful. I especially liked the Eagle Point Area. Just fantastic to see what nature can carve out. The weather was cold, but dry- you just have to dress for it! Definitely recommend this touring company and you are in luck if Mannybis your driver! Fun day! Pick up on time driver Tricia was very friendly and helpful in telling us about sights and helping us enjoy . Stopped for 30 mins at Hoover Dam got all the pics we needed .moved on to Grand Canyon which was awesome . Must do skywalk at eagle point had lunch at Guiana point then enjoyed western ranch . Our driver was excellent, really good local knowledge and willing to share it. I had 3 older teens in tow and they also enjoyed the day. It is a long day and it was very hot in early Aug but it can be done. The driver's supply of cold water was also key. I didn't do 5 stars because van had not much ac in back and on way back to hotel in 112 ac was necessity. We reported that to driver and she said would pass it on...the Hoover Dam segment was perfect. Starts off with a short drive through the Strip as the driver and tour guide Ward picks up the other passengers, before heading off towards Hoover Dam. One of my favourite parts of the trip, Hoover Dam was a spectacular sight to see in terms of pure engineering. Afterwards we had a quick pit stop at a local hotel before going towards the Grand Canyon Western Rim. There our group were free to roam around and do our own thing, with some initial guidance from Ward. Following his advice, I skipped the first part at the Ranch and spent more time with the actual canyon, first at Eagle Point and then the more impressive Guano Point. Even on a hazy day the views were absolutely breathtaking, well worth the price of entry. A nice relaxing drive back to Vegas finished the day for us as a group. Ward was a great driver and guide, a wealth of knowledge, both local and the tourist areas he was taking us to. Definitely recommended tour! Ward was excellent. good info, courteous and considerate with plenty of rest stops! trip itself was amazing, a must see if you are in Vegas. We had a great day tour of both iconic sights. The Hoover Dam was impressive as was visiting the Grand Canyon. 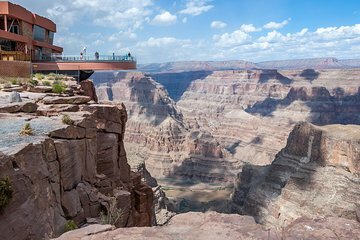 There was a rather heavy commercial aspect to visiting the Grand Canyon, however, since you had to pay to view the canyons depth from the skywalk. We were told even after paying the optional price, you could not bring your own camera for pictures. This means the only pictures taken had to be paid for. Future visitors should be forewarned. Yet, that did not distract from a very pleasant day.